Obatala is the eldest orisha and father of all the orishas depicted here in full regalia as a stunning bronze resin statue. Obatala created the world and the humanity that resides within. He always dresses in white to reflect his spiritual purity, white is thus the most sacred color in Santeria because of its representation of Obatala. He acts as a protector for those who do not yet know their guardian orisha, and encourages his believers to be patient and to handle matters with calm and reason. Obatala watches over his believers and his duty is to maintain peace and restore balance to the world. An Orisha is a spirit that reflects one of the manifestations of God in Africa's Yoruba religion. Many Orishas have found their way throughout the Americas via the Atlantic slave trade and are now expressed in practices as varied as Santeria, Candomble, Trinidad Orisha, and Oyotunji. 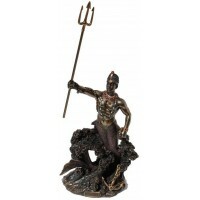 This beautifully finished cast bronze resin state stands 12 inches high with hand painted accents. Item Number: UI-WU76208A4 | Approximate Size (Inches): 5.00 wide x 3.50 deep x 12.00 high | Approximate Shipping Weight: 3.00 lbs.